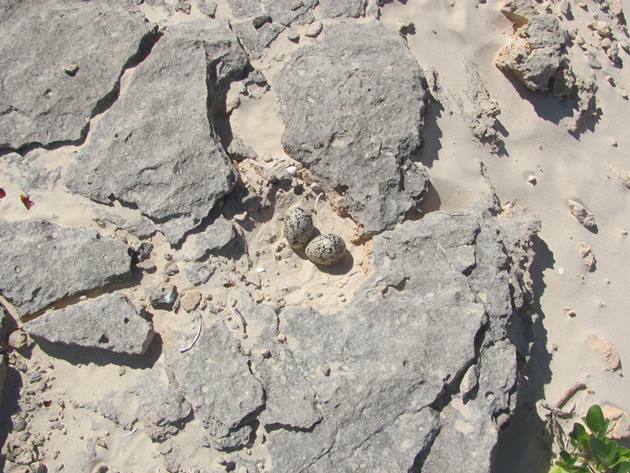 This year is the eighteenth year since we discovered our first Pied Oystercatcher nest on Cable Beach in Broome and it didn’t take us long to realise that they are not at all successful at raising young due to egg and chick predation. Thankfully due to the long life span of this bird species the population appears to be somewhat stable at the moment. 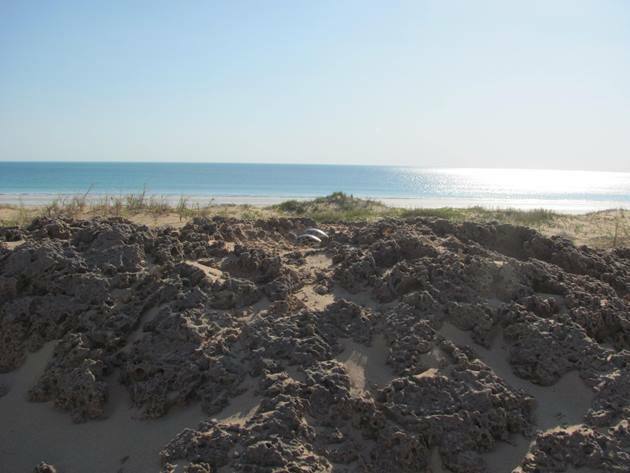 The Northern area of Cable Beach fares even worse than the area closer to habitation despite there being more pairs of Pied Oystercatchers. It is not unusual for only one Pied Oystercatcher chick to survive throughout the whole breeding season despite in excess of sixty eggs being laid by sixteen pairs. It is for this reason that there was not an update last year on Pied Oystercatchers breeding success, because there was not any. The last successful breeding year was in 2016 when the eggs were laid a little earlier than the usual July 1st and one chick did survive to join other Pied Oystercatchers in a non-breeding flock for a few years. This year we have also had eggs laid earlier than July 1st, but we have also had some cooler nights than some years and two weeks earlier is not significant. If these first clutches fail then there is ample time for more clutches to be laid and we have had pairs lay eggs as late as the start of October. Due to the fact that all of the pairs of Pied Oystercatchers that we monitor nest in the same location each year it is easy to find the nest sites. Some of the nest sites have eroded away over the cyclone season, but the Pied Oystercatchers choose a new location only metres away from the previous years. The Pied Oystercatcher sitting on eggs in the header photo has used that particular area of Cable Beach just north of the rocks since 2008 and the pair has only successfully raised one chick and that was in 2012. Each year we hope for anther success, but so far it has not happened. 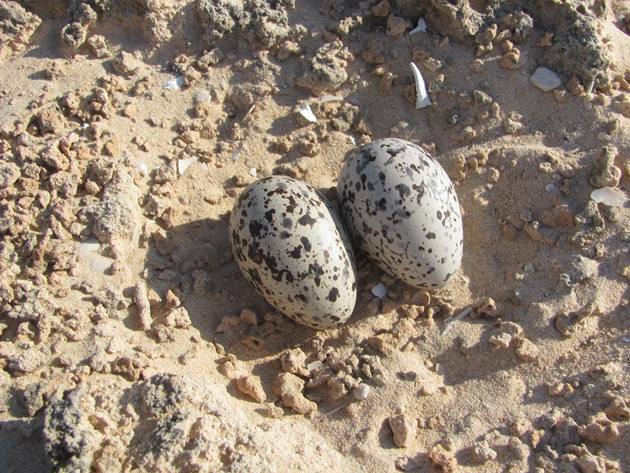 The first clutch of eggs that this pair has laid this year is on the grey sandstone and they always nest either on the sandstone or sand in this area. We make one brief pass of the area to confirm the number of eggs, which is most often two eggs, but occasionally only one egg late in the season. One pair of Pied Oystercatchers does occasionally lay three eggs and they have been successful with all three eggs fledging in the past. 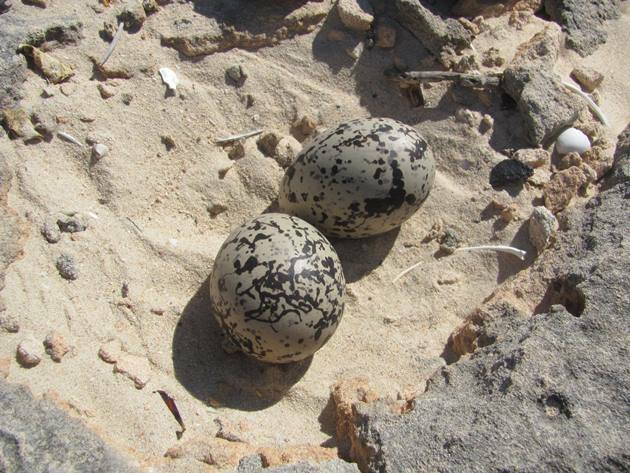 One other pair of Pied Oystercatchers also laid eggs two weeks ago and the male bird was marked by the Australasian Wader Study Group in 2005 as an adult bird and the flag reading “A1” is easily read, so we can identify this individual throughout the year. This Pied Oystercatcher currently has an unmarked mate, so we can’t be sure that it is the same individual as other years and we have noticed rather a lot of partner changes over the years with birds that are identifiable. 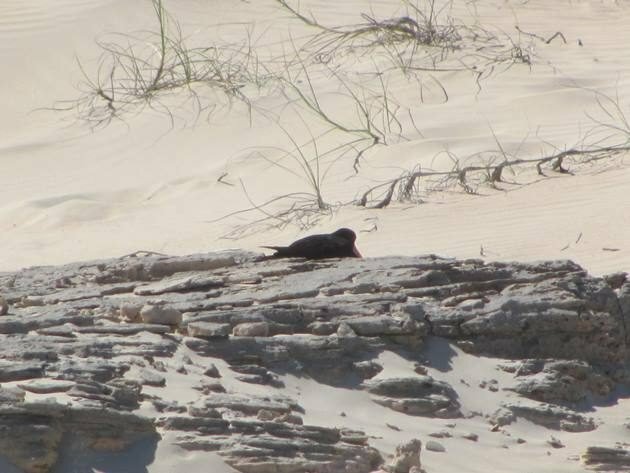 Many a birder over the years have no doubt noticed “A1” on Cable Beach and he is highly tolerant of people and invariably watches you walk by if he is not sitting on the eggs or looking after young. We have encountered him house-keeping a new nest site for his partner and sitting on the eggs as they hatch and is an attentive bird. He last raised a chick successfully in 2016 and has nested in this area since 2008. The nest site that this pair of Pied Oystercatchers use is a great site “with a view”. They always manage to sit for the twenty eight days and hatch the eggs out, but invariably lose the chicks within the first two weeks of them hatching out. Birds of prey are present throughout the dune system and are a real threat to young Pied Oystercatchers despite the parents flying at them to try and protect the young. As you can see from the two nest sites the eggs do vary slightly in colour and patterning and are all individually identifiable. The first egg laid is not necessarily the first egg hatched, but they do hatch within about 24 hours of each other. A recent threat to the area where all of these Pied Oystercatchers nest is the sudden interest in using “fat bikes” in the dune system. Many a cyclist must wonder why they are being chased off by a large bird as they ride up and down the dunes and hopefully they will consider the nesting birds and keep to the expanse of sand below the high tide mark in the future. 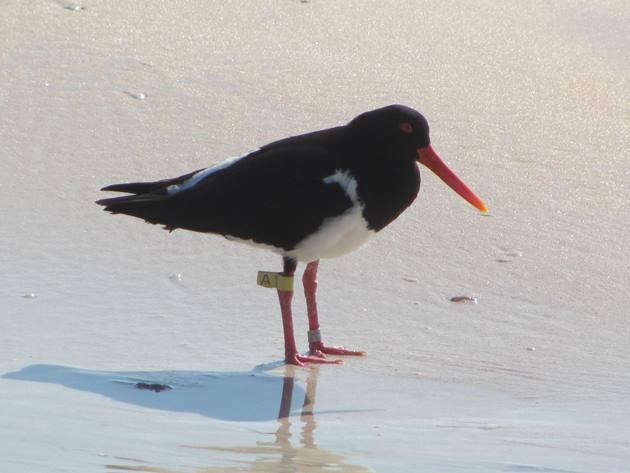 We will continue to monitor the Pied Oystercatchers along Cable Beach once again for the rest of the year and hopefully I can bring you some good news later in the year about successful breeding.